In the end, the Dell EMC VMAX 250F with Intel® Xeon® Processor All Flash storage array lived up to its promises better than the HPE 3PAR 8450 Storage array did. 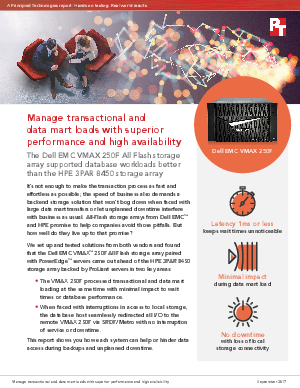 We experience minimal impact to database performance when the VMAX 250F processed transactional and data mart loading at the same time. This is useful whether you're performing extensive backups or compiling large amounts of data from multiple sources.